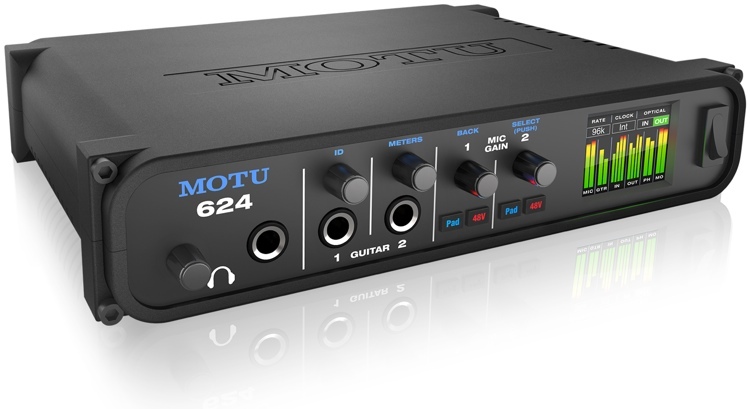 Motu 624 is a 16 inputs and 16 outputs audio interface. It is a hybrid Thunderbolt/USB 3 unit, equipped with renowned ESS Sabre 32 Ultra DAC technology. The result is a superb audio quality and high-end converters which will deliver professional quality recordings. Motu 624 has also an AVB/TSN Ethernet port so that it’s possible to connect the unit to other Motu audio interfaces. It will allow the user to expand I/O numbers and even create an audio network that can include wifi devices, such as iPads, iPhones, and more. The product has two hi-z inputs with independent gain controls on the front panel. There are also two mic gain knobs, with independent phantom power and pad switches. A phones output is present, with a volume knob. A full-color LCD shows all signal activity, such as mic and guitar levels, sample rate, clock, phones and main output levels, and more. The rear panel has two XLR mic inputs, four TRS line inputs, four TRS line outputs and two main outputs. Optical ADAT In/Out will add eight more input and eight more output channels. There are also three data ports: Thunderbolt, USB 3 and the AVB Ethernet port. Motu 624 comes with a built-in digital mixer, delivering large console-style mixing with 48 channels, 12 stereo buses and latency-free routing. Connect the unit to a wireless router and control the mixer on a tablet, smartphone or laptop. – Includes AudioDesk 4.0 for Mac and PC. 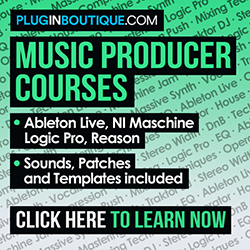 Motu 624 is compatible with most renowned DAWs in the market, such as Pro Tools, Cubase, Ableton Live, Logic Pro, Garage Band, Reason, Reaper, Kontakt and more.